It didn’t take us long to empty the first keg of our Zymaster® Series No. 1–California Lager. 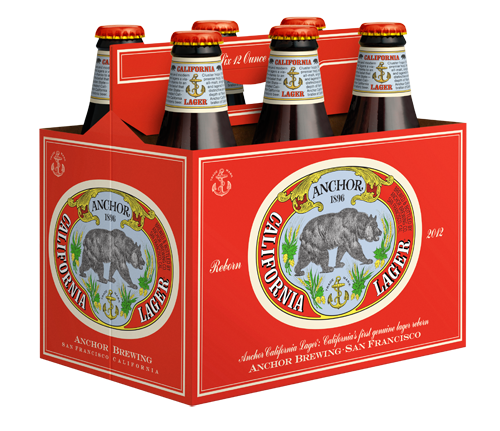 By the time we’d hooked up the second, we were already discussing the possibility of turning this unique brew into a year-round product, Anchor California Lager®. 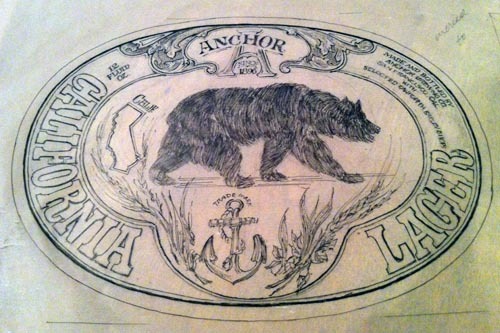 This historical American beer—our re-creation of California’s first genuine lager—required a historical label that conveyed our story as well as the story of Boca Brewing, which released California’s first genuine lager in 1876. 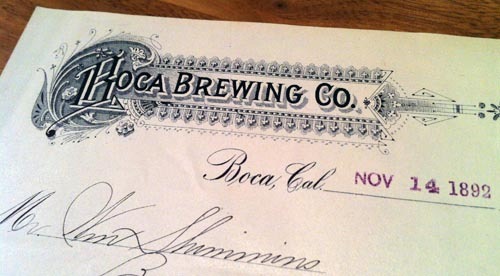 Boca letterhead—sent less than two months before fire destroyed the brewery. David Burkhart Collection. A Boca bottle—the “Bob” signifies Boca Brewing Co. (not Bob Brewer). David Burkhart Collection. 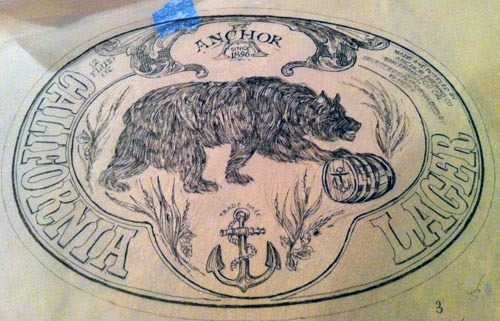 The Boca Lager label appears on an extremely rare 1880s trade card in the Anchor Brewing Collection. Boca trade card, circa 1883-1886. 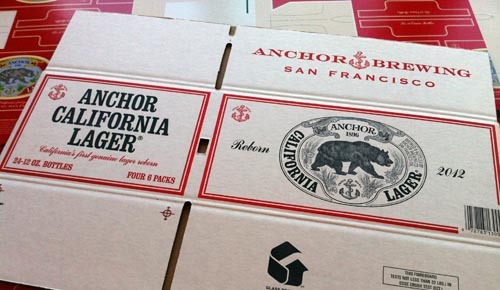 Anchor Brewing Collection. I’ve always enjoyed the fact that the bear on Boca’s “EXPORT” label is heading east. Construction of the transcontinental railroad led to the creation of Boca’s sawmill, ice pond, and brewery. Boca Brewing shipped its hops and barley in by rail. And it shipped its beer out by rail, much of it eastbound, in handsomely logo’d boxcars. 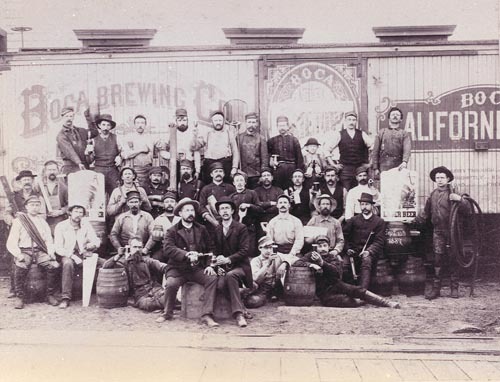 Boca Brewing boxcar and brew crew, 1887. Photo courtesy of the Truckee Donner Historical Society. 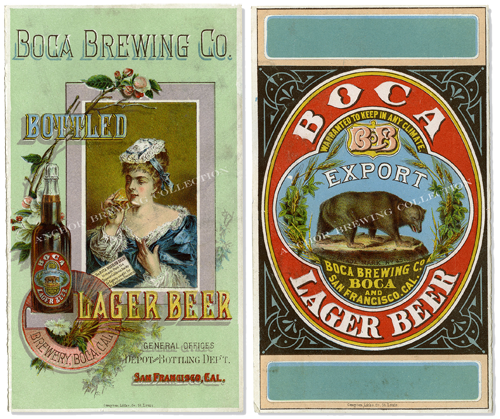 The shapes and colors of the Boca label give it a distinctively nineteenth-century charm. I wondered how Boca’s vertical oval would look as an Anchor-style horizontal oval. Don’t worry; I used a photocopy of the original to create the rough cut-and-paste job below. I met up with our longtime label artist, Jim Stitt, to discuss the concept for our new label. 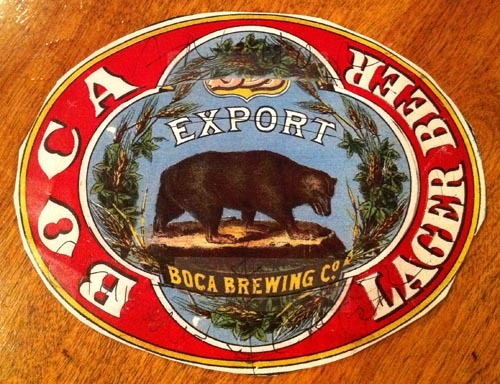 Although the Boca label was captivating, we weren’t that keen on the Boca bear. Nor was Jim that excited about trying to draw a new one. I said I’d get to work on the bear if he’d get to work on the label. Fortunately, for my part of the bargain, I already had a secret weapon, Susan Snyder’s Bear in Mind. 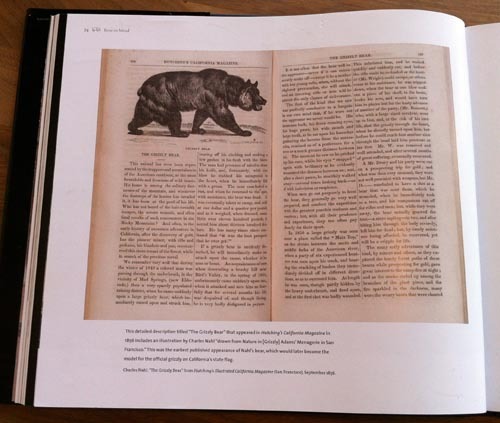 It didn’t take long to find a favorite bear in the book, a woodcut by Durbin Van Vleck (1833–1898). 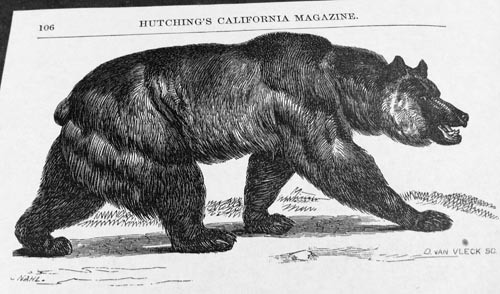 First published in 1856 in Hutching’s California Magazine, this woodcut is a superbly crafted rendering of an original illustration by Charles Christian Nahl (1818–1878), who had painted both eastbound and westbound versions of this bear. The story of the Nahl bears is well told in California Grizzly. 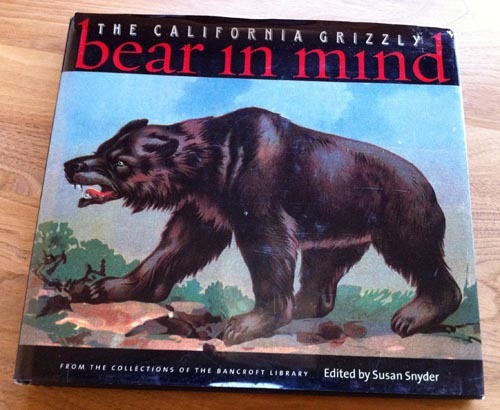 California Grizzly cover (left) and one of two known Nahl paintings of this bear (the other faces right) from California Grizzly (right). 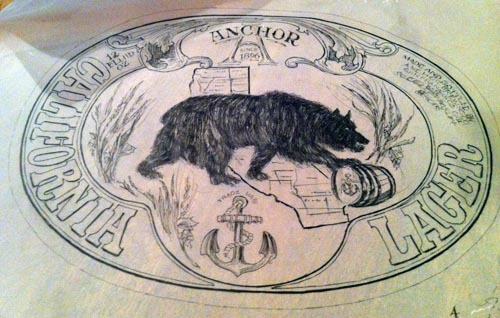 In the 1950s, Nahl’s bear served as inspiration for the design of the bear on California’s modern state flag. Although that bear is heading west (unless your flag is blowing the wrong way! 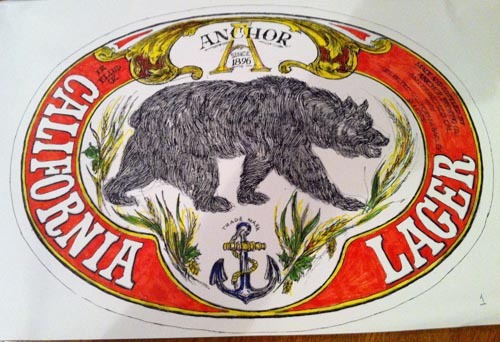 ), our label bear—like the bear on Boca Brewing’s historic lager label—is heading east. 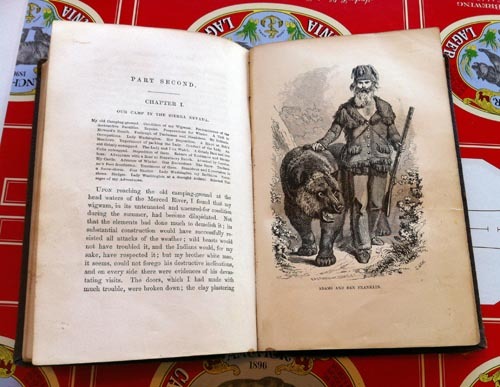 Nahl would draw other bears, including those in Theodore Hittell’s 1861 biography of Grizzly Adams. The Adventures of James Capen Adams. Illustration by Nahl. A week later, I headed back to Jim’s boat to show him Susan’s book. I didn’t reveal which bear I liked best. Just as I’d hoped, he paused on page 74 and said, “That’s the one.” And that’s the one we used on our Anchor California Lager®, courtesy of The Bancroft Library, UC Berkeley. With both concept and bear in mind, Jim sketched the label, using the red that—along with the bear—would prove essential to its success. 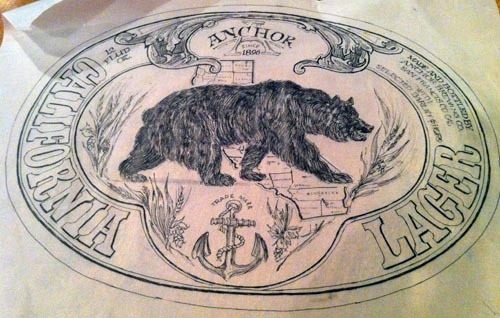 Ultimately, these versions confirmed our conviction that Anchor California Lager® was all about the bear—our uniquely historical California bear. 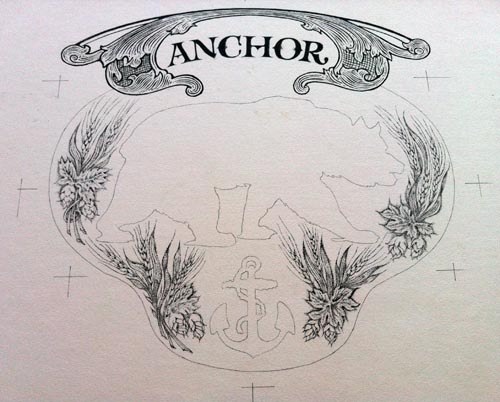 We would eventually add him and our anchor to Jim’s newly and gorgeously drawn masthead, hops, and barley. 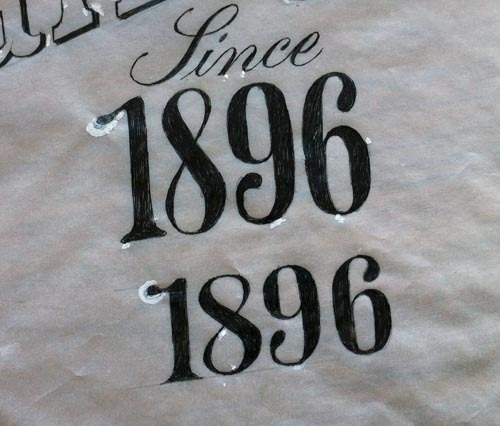 Even the “1896” on our label was hand drawn by Jim, who does not own a computer. Everything came together digitally thanks to some great scans from The Bancroft Library and the Blow Up Lab as well as the incredible talent of our graphic designers Jack and Elaine. We created a black-and-white label for our shipping carton. 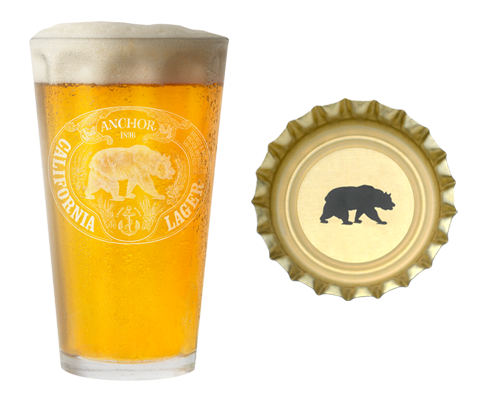 There’s only one color that we like better: the color of a cold glass of Anchor California Lager®! I really enjoyed this article and can’t wait to enjoy the beer. I like the way the process of producing the label is explained. I’m curious about the use of someone else’s drawing and whether you need to secure permission to use it. I love the labels you have and enjoyed a previous video about the Christmas labels. Go BEARS! And it’s nice knowing that Cal’s Bancroft LibrRy was so helpful. A classic label. Thanks for sharing the creative process that created it.